In the news this week, Facebook has announced two major changes to how it ranks the links pages share. The first is the practise of ‘click-baiting’. Click-baiting is where a business will share a link to a website, but do not include descriptive or useful information about the linked page in the Facebook post. The example Facebook used was of a gossip magazine, linking to their website; the description did not accurately describe what the readers would find (they used a vague outline) and the associated photo didn’t provide any clues. Their research has showed, the not so surprising finding, that people find this practise misleading and it was therefore unpopular with users. With this in mind they will be monitoring how long people stay on the linked page and then rank the associated Facebook post accordingly. The longer people stay on the linked page (indicating that it is interesting) the greater the ranking it will receive and more likely it will be to appear in Newsfeeds. Should the link and post be misleading (meaning people quickly follow the link and realise it’s not what they were expecting to see and leave) then the post will not be highly ranked by Facebook and it is unlikely to appear in the Newsfeed. 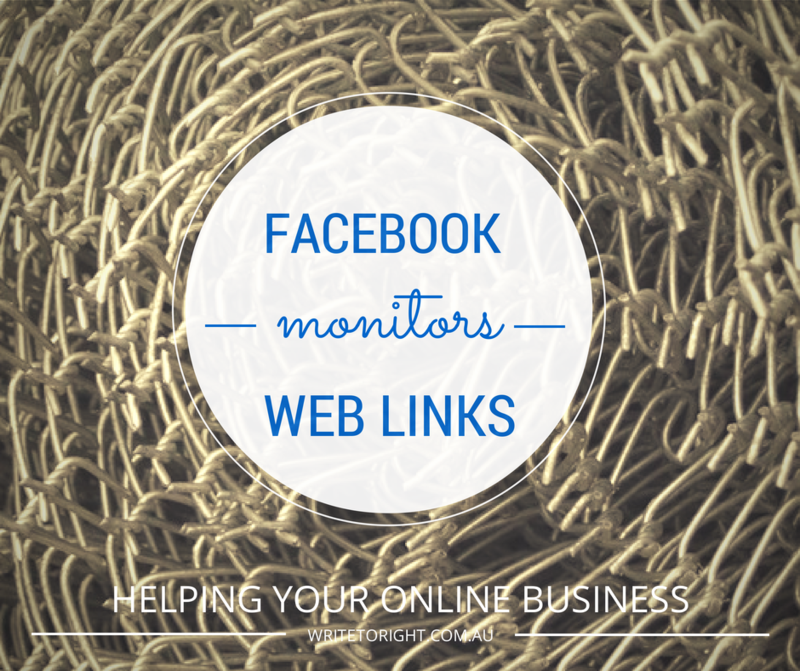 The second change was how Facebook would rank the way businesses posted links. Some businesses will paste a link into their post from a website and then allow Facebook to display the associated image and description in the post. 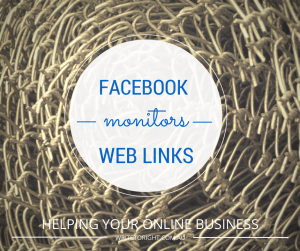 This is how I share links and I have previously described how doing this is beneficial to your page. Other businesses will paste the link into a photo post, where they have uploaded a photo and then add the link into the description. Facebook has done some research and found that the majority of users will click through when the business shares a link with the associated site information, rather than those who add it as a photo description. For businesses who use click-baiting, you will see a decline in your reach. What I would encourage businesses to do is to be honest, accurate, and sociable. Your Facebook page is there to build a relationship. I mentioned last week that researchers believe it takes five touches to gain a customer, so use your touches wisely. Think about your core beliefs, I discussed this in finding your online voice, and if honesty/integrity/truth are on your list then click-baiting shouldn’t be in your tool box. I admit, that before reading this Facebook article, I often deleted the link address from my posts as I thought they looked ‘ugly and clunky’. I am now leaving the links in, as a little extra information. I used to use link shortening, my website even has it as an add-on (I also used Bitly), as a way to provide the link for mobile devices (and to make my posts look tidier). I am going to rethink using shot links. If you prefer the look of the shorter links, try editing the link to provide a more meaningful link than the randomly generated list of letters and numbers. What it means for your website content will ultimately depend on the platform you use. Both of my sites are WordPress, so my products, pages and posts all have: at least one image (I don’t always set them as featured), and a meta-description. I use Yoast for my SEO and a recent addition to the tool is the ability to add a Social Media description. This description, as you can imagine, is what is displayed when you link to that item on a social media platform (like Facebook). Ordinarily Facebook will take the first few lines of your content and add it as a description, with the image, when you upload a link. If you specify a meta-description, it will use this data instead of the first few lines. If you use Yoast’s Social description, it will use this data. This is handy as you can then tailor your descriptions for your audience and/or SEO. Write to Right offer website health checks, where one of the tasks is to check the meta-descriptions on your pages/products. Now that you have read about how you can use this information to benefit your business and would like to know more about how Write to Right can help, please use the contact form and we can discuss your needs. 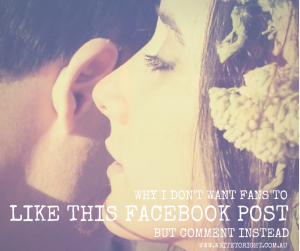 Have you seen the post around Facebook detailing how a woman stopped ‘liking’ posts and it changed her Newsfeed? I’ve recently read it and I wondered how it worked. I have done a little research (and I do mean a little, you only need to read up about the Facebook algorithm, EdgeRank) to find out how this could work. EdgeRank determines which content goes into your NewsFeed, and it doesn’t discriminate People from Pages (no one is immune). EdgeRank has recently become an unwieldy 1 000-factor beast that includes content quality, content origin (heed the warning Hootsuite users), and completeness of page details. The main determinants of if a post appears in your NewsFeed are still: Affinity, Edge Weight, and Time Decay. The anti-like/pro-comment movement hinges on two parts: the Affinity score and the Edge Weight. The Affinity Score is concerned with how close/related/connected you are to an action. The more you have in common with the person or page undertaking the action, the more likely it will appear in your NewsFeed. So the more friends you have in common, the more you like or comment on their posts, the more you will see. Now here’s the thing, likes and comments are not equal. Most people know that, and let’s face it – how much effort does clicking like take compared to typing a comment? This is exactly why EdgeRank rates posts (gives a greater Edge Weight) with comments or shares higher than posts with just likes. Even the lowly emoticon smiley carries more weight than clicking the like button. Lightbulb! To all the Facebook page owners asking their fans to ‘like’ if they see your post and still not appearing in NewsFeeds – now you know why. Comments also provide the ability to interact with your customers, engage in conversation, develop your relationship. Even at an extremely shallow level, increase comments and therefore the likelihood that your posts will appear in the NewsFeeds. I have mentioned previously that customers buy AFTER a relationship is developed, some researchers even say that it takes five ‘touches’ before you will get someone to buy from you. (I want to explore this further in the future) By encouraging a discussion on your posts and page, you are developing a relationship. You are opening up opportunities to educate and possibilities to introduce products. Comments can also be seen as ‘third party endorsements’. 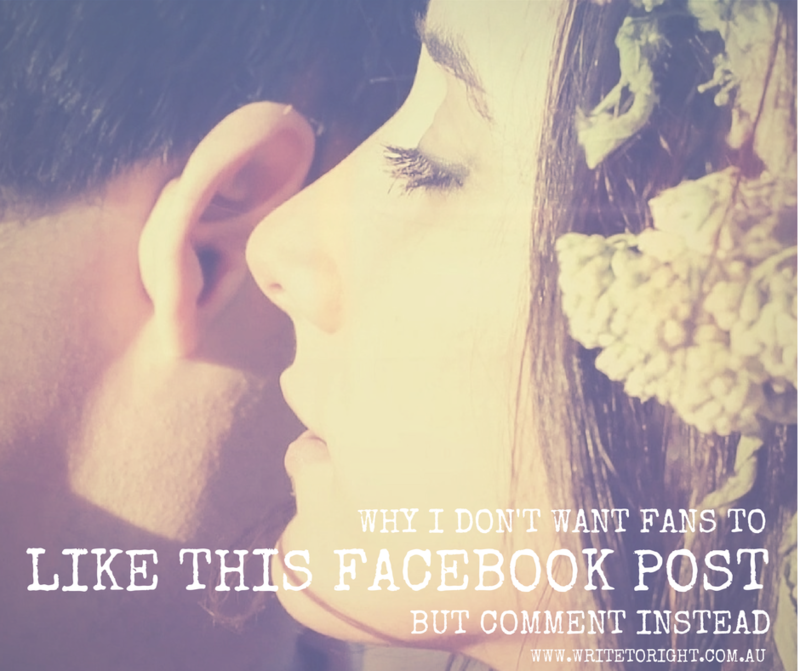 I will pay more attention to a friend’s comment on a page than their like of a post. Why? I trust what they say and I want to know more. I understand how little effort a like takes over a comment, and I appreciate that effort. So when a friend provides a comment or feedback on a business post or page, I take notice. We all know how word-of-mouth works, and its power. So a comment on a post is more powerful than a simple like. Now here is the issue, how do you get the comments? There are fun ways like ‘what’s your celebrity name?’ or you can ask a question. You can inject a little controversy on to your page. You can ask for advice. I have tried most of these on my other business page and to be honest, some work better than others (Your Easter Bunny name was a great one this year). As I have mentioned previously, it’s all about your customer and the voice you want to portray on your page. I do know that comments and shares are extremely beneficial to your post reach and it has a flow on effect to the talking about numbers. The best of all is that if you discover the type of content which provokes comments, then you will find that the effect snowballs. The reach of the page I mention was previously around 10% of total likes, it is currently approaching 200% of total likes. Additionally, my talking about rate has increased from a very standard 1% of total likes to 4.5% of total likes. I will add that I have made a number of other changes, that saw an initial increase in talking about, and a subsequent change which increased the reach. Though none of them have has such a profound impact as providing content that engaged my customers and increased comments and shares. Is there anything about running a website or social media that has you wondering? Let me know in a comment below & I will investigate and address it in future. Search engines ‘crawl’ through websites looking for the words your customer enters into the search box. 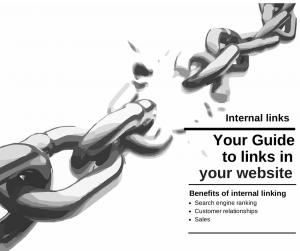 Deep, and meaningful, website links allow for more pages to be returned from your website (increasing its ranking); it also gives you the means to increase your customer relationships and sales. The more you use the searched words (keywords), the higher you will appear in a search. Be warned, don’t stuff all the keywords into your content or you will make the page an unintelligent mess. 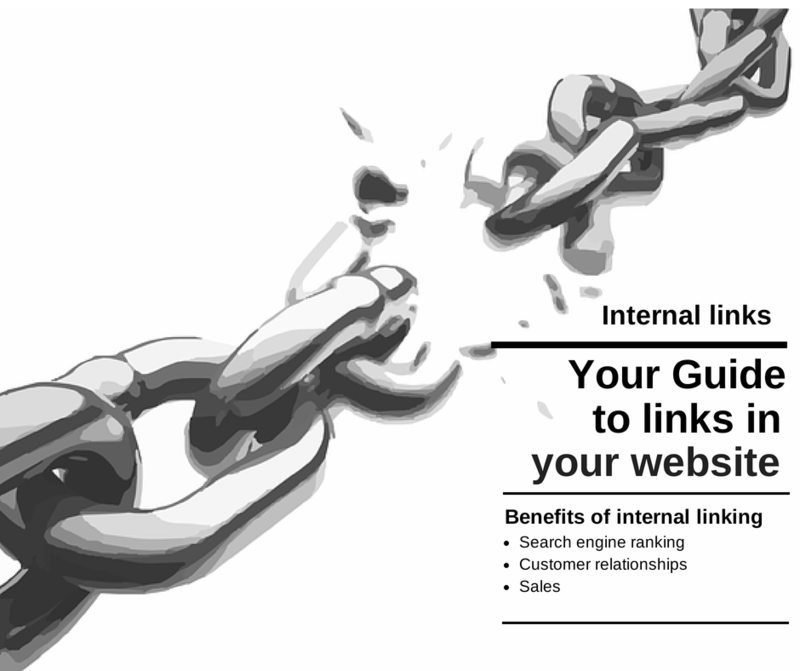 Savvy website owners, who remember the days of website crawlers, ensure that they cross-link their website. When a search engine comes across a link to another page, post, or product, it will follow this link and search the page for the information listed above. The higher the number of instances it finds for the searched words, the higher your website will be returned in the search. – Links between related blog posts or products. ‘Would you like fries with that?’ It sounds cliché, but you’ve worked hard to get your customer to your website – make the most of it. Suggest another product, you never know they might have been looking for that too! Don’t waste their time though (remember, we are increasingly time poor), send them to products that you know will help. Here’s a freebie hint: when you get them to the recommended product, make sure you sell them the benefits of the product AND link them off to another product. ‘Would you like to super-size that?’ OK, so you don’t always have to sell something bigger, but make sure you sell something more. Is there a little (or large) something extra, that would coordinate with the item they are buying? Do you have it packaged in a set with something else? Both of these are opportunities to upsell. Don’t forget my freebie hint: sell the benefits & link on! Peer pressure, kids are fabulous at it and adults aren’t immune. Customers like to know that others share their tastes. They like to know that others trust your products. They like to know that the benefits you are selling are true & others have benefitted. Please be honest though, you will lose the opportunity to have a repeat customer if you lead them up the garden path. How do you find out what others buy? You can trawl through your sales records, but many e-commerce platforms will tell you the ‘most popular’ item on your website – so use that! Alternatively, if you use a webmaster tool such as Google Analytics, you can look at the products with the most hits and promote that item. Better still, do both! Following on from ‘people also bought’, is linking to your testimonials (or reviews). One of the most powerful sales tools available is the endorsement of another person. It instils confidence in your customer that you have met the needs of others, and are more likely to meet theirs. This personal interaction helps, not only to instil trust but, to develop a relationship with your customer. Sales are founded on strong relationships (one of the key benefits of social media); testimonials allow customers to ‘hear’ what others say, foster trust, a sense of brand identity, all leading to a development of a relationship. Think of it as beginning a new friendship: you see someone you like, you hear someone say nice things about them, it sparks your curiosity, and you go over and have a chat. Blog posts are a fabulous way to create content to keep your website current (a key to achieving a high Google rank), a way to create content for your social media, a way to sell benefits, and a great way to engender trust and build relationships. When you link to related posts, you are helping to answer more of your customer’s questions, building trust, and building relationships. When you link blog posts to products you are educating and selling benefits. Linking across your site ensures that search engines find more of your site, if they find more of your site – so will your customers. I hope this encourages you to dig deeper into your website. If you would like Write to Right to check your site to ensure that it has all the right words in all the right places, then contact us or have a look through our Website Health Check packages.